As the countdown to the Oscars enters the final hours, TheWrap's Party Report delivers all the key people, parties, and places from celebrations across town in this continually updating gallery. "Foxcatcher" nominee Mark Ruffalo and Sunrise Coigney turn around in their seats at STK on Saturday night to accept congratulations during Sony Pictures Classics' dinner. SPC has 18 nominations. 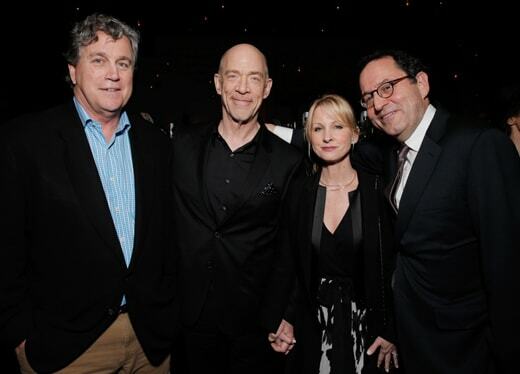 Everyone in this photo should be happy: Tom Bernard, frontrunner JK Simmons (to Ruffalo's detriment), Michelle Schumacher, and Michael Barker. The scene on La Cienega outside the STK Supper Suite, which hosted the Sony dinner. David Manning's A-List Communications produces the traveling series. "Whiplash" writer/director Damian Chazelle has been the "must-meet" for many this awards week, reportedly getting an audience with Mick Jagger on Thursday night. He and Jasmine McGlade arrive at the SPC dinner, where the step and repeat nods at sponsors Kia and Ketel One vodka. Meanwhile, the belle of last year's SPC ball, Cate Blanchett, hosted a party with Roberta Armani in Beverly Hills on Saturday night. The hostess with an Oscar poses with Matt Bomer and Greg Sulkin. Over at the Sunset Tower, Julianne Hough and Malin Ackerman got close at the now-annual party hosted by agents and managers Michael Sugar, Warren Zavala, and Doug Wald. The Sunset Tower - typically packed. This space only became available in 2014 after Vanity Fair pulled up it's stakes and moved on. Mindy Kaling and B.J. Novak made a couples' appearance at the party. Michael Keaton wore his sunglasses, even inside the big Spirit Awards tent at times, on Saturday afternoon. He also hit the Heineken tent with Sean Douglas and Rachel Bartov before "Birdman" won big. Team "Nightcrawler" also had a good Saturday: Dan Gilroy, Rene Russo, Open Road CEO/President Tom Ortenberg, Open Road's Jason Cassidy, and supporting actor Riz Ahmed pre-game the Spirits. Fashion correspondent Louise Roe, Selita Ebanks, and Catcha's Patrick Grove huddle up by the beach on Saturday afternoon. "Inherent Vice's" Yvette Yates (left) and Jordan Hearn (right) were amongst the faces getting filled with Breyers at their gelato tent as the scene swirled behind them. On Saturday morning, "Captain America" star Chris Evans stopped by the Gold Meets Golden event hosted by Maria Shriver at Equinox Sports Club West Los Angeles to meet with athletes who'll be competing in the World Games this summer. Maria Shriver and Katie Holmes were best buddies at the Gold Meets Golden event hosted at Equinox Sports Club West Los Angeles on Saturday morning as they took a break from the Oscar glamour in denim and sneakers. Nicole Kidman was a late arrival at the Gold Meets Golden event at Equinox Sports Club West Los Angeles because was filming “The Secret in Their Eyes” in Pasadena, but jumped right into hugging the Special Olympic athletes when she got there. Katie Holmes, Nadia Comaneci, Gina Rodriguez and Chris Evans gathered to ring in the Special Olympics at the Gold Meets Golden event on Saturday morning. Richard Perry, Jane Fonda, one lucky dog, and Netflix chief Ted Sarandos had a toast to "Virunga" at Sarandos and Nicole Avant's house on Friday night before the agency parties kicked in. Five weeks removed from the horrific NFC championship loss, packers QB Aaron Rodgers has been attending Oscar week events with Olivia Munn. On Friday night, they hit Grey Goose and Killer Films' celebration of "Still Alice" at the Sunset Tower Hotel. "Still Alice" producers Pamela Koffler and Christine Vachon with frontrunner Julianne Moore at the Sunset Tower on Friday night. "A Most Violent Year" director J.C. Chandor, Teddy Schwarzman (who produced Chandor's previous film "All is Lost" before taking on Best Picture contender "The Imitation Game") and "Blue Valentine" producer Rena Ronson, as the french inspired cocktails like Grey Goose Le Fizz and Grey Goose Je Crois flowed on Sunset. Andy Boose and the guy who will be busy on Sunday afternoon and night, The Elton John Aids Foundation Executive Director Scott Campbell. Meanwhile at Ysabel in West Hollywood, Kelly Rowland hit Common's party with Ciroc to celebrate his nomination. Oprah and Ava DuVernay were on hand as well. UCLA's School of Theater, Film and Television had its annual "Sketch to Screen" panel on Saturday while the Spirit Awards were taking place. Nadja Swarovski, Deborah Landis (who produced the "Hollywood Costume" exhibit), and Dean of the school Teri Schwartz inside UCLA's Schoenberg Hall. Highlights from Friday night's parties included Meryl Streep, Rory Kennedy, and the Tom Ford fashion show. On Friday night, Meryl Streep was "the get" at Women In Film's cocktail party for nominees at Hyde Kitchen on Sunset. "To have Meryl Streep here at our party and speaking to all of us about sisterhood and supporting each other was incredible," Schulman told me as the party wound down. Overwhelming favorite Julianne Moore (wearing Tom Ford) with Bart Fruendlich graced the first of many carpets this weekend for her at Milk Studios on Friday night. Tom Ford's first Womeswear show drew Gwyneth Paltrow, Scarlett Johansson, Olivia Munn, and Miley Cyrus amongst others. Rory Kennedy's lunch with 50 of intimates at the Chateau to celebrate "Last Days in Vietnam" on Friday brought together names from fashion, film, politics, and media. "I've known Andres (Balasz) for 25 years, he's one of my closest friends so I'm not sure (awards season) has gotten us closer, but he let us use the Chateau to host parties early in the season," Kennedy said of the hotelier (left). Minnie Driver had a flower in her hair by the end of Dom Perignon's three course, three glass lunch. Peter Fonda and Donovan Leitch personified the reach and breadth of Kennedy's supporters. Last year, Dom Perignon honored Morgan Neville and "20 Feet From Stardom" in the same setting, two days before it would go on to win the Oscar. Ron Yerxa, who went through awards season last year as a Best Picture nominee for "Nebraska," wedged in between the co-heads of table Mark Bailey and Kennedy. First cousins: Rory Kennedy and Maria Shriver brought the glamorous side of politics to Oscar week. Sonya Falcon, Nicole Ruvo, and Jennifer O. Hill in the Chateau courtyard. Unaffiliated, Richard Lewis showed up near the luncheon ordering what looked like a Coke-float. Massachusetts natives Bill, Will, and Angela Lowell have 12:30 p.m. Dom with PBS' "American Experience" Executive Producer Mark Samels (far right) before the sit-down. MPAA Chairman Chris Dodd did not cast his Oscar ballot until Tuesday, the last day of voting he told me at the Great British Film Reception on Friday night. True to his political roots, the former Senator arrived with Congressman Bob Goodlatte. 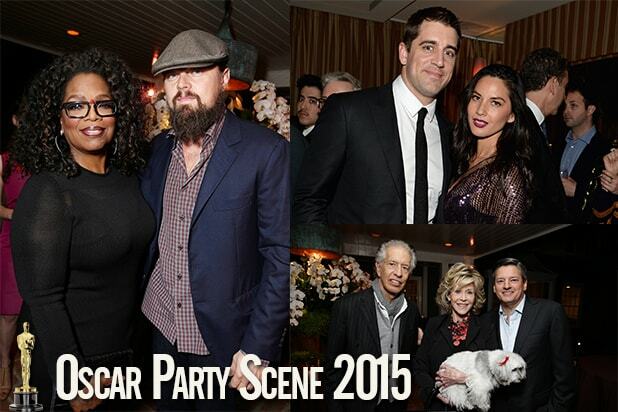 For more party coverage from earlier in Oscar week, click here. In the midst of Oscar week, a couple of studio bosses jetted off to London to join Prince Charles and Camilla at the Royal Premiere of "The Second Best Exotic Marigold Hotel" on Tuesday night. From left, Jonathan King. Fox's Jim Gianopulos, Participant’s Jim Berk and Searchlight co-President Stephen Gilula. Jonathan Darby (2nd from left) and Jason Allen (far right) walked the orange carpet for the Participant and Fox co-financed sequel. The one funny voice not at "SNL 40" Jimmy Kimmel and his parents Joan Kimmel and James hit the Los Angeles Italia Opening Gala at the TCL Chinese, one week to the minute before the Oscars would take place next door.